A GLITTERING assembly will be treated to a close encounter with the best of Savile Row in Italy next year, when a unique presentation from Savile Row is staged. Purple checked d.b. suit with coordinating shirt and tie from Ozwald Boateng. Under the title The London Cut, this will coincide with the Pitti Uomo event in Florence in January, the premier trade show for the international men’s clothing market. And as evidence of Italy’s recognition of Savile Row’s eminence in the male clothing stakes, the exhibition’s organising body is generously hosting a special exhibition of Savile Row outfits. Such illustrious Savile Row names as Henry Poole, Dege & Skinner, Anderson & Sheppard, Richard Anderson, Huntsman and Gieves & Hawkes are among those making items especially for the presentation, which will have a gala opening night attended by VIP’s, celebrities, press and trade buyers. The show will display over 40 bespoke suits made by the tailors, a first for any clothing exhibition, and certainly the first time the Row’s houses have made especially for a showcase event since their own Bespo fashion shows of the late 60s. Sponsored by the Italian hosts and with some help from the British wool industry through the British Wool Textiles Export Corporation, it will provide many visitors with their first encounter of bespoke suits, jackets and dinner jackets. They are to be viewed in the suitably grand setting of the Palazzo Pitti for a month, opening on January 10 and continuing there for a month. For tailoring afficionados, a treat not to be missed. It may then come on to London. Talented fellow charged with curating the exhibition is James Sherwood, London-based style commentator, who is also writing a book to commemorate this landmark event. He is determined to show that the timeless elegance of clothes cut for such style figures as Edward Vll, Fred Astaire and Cary Grant continues in today's Savile Row creations. One of those contributing to the event is Oswald Boateng, representing the younger, more fashion-orientated face of Savile Row. In addition to his bespoke work, he also produces an extensive ready-to-wear collection, and in both displays a propensity for using colour that shows Savile Row is not always staid - see pic above. More photographs from the exhibition will be shown in a future edition. Grand old Savile Row institution, Henry Poole,is celebrating not only a 200th anniversary this autumn but also the signing of a new lease that secures their premises in the Row for the next 15 years. Managing director Angus Cundey is delighted and relieved that protracted negotiations have finally been completed to ensure the firm remains in the Row. 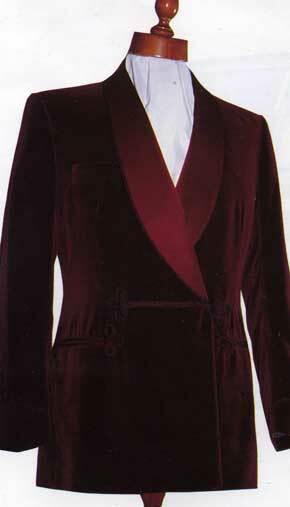 Poole’s are also contributing to the Italian showcase event (see above), with a new version of a smoking jacket style that they initially made for the Prince of Wales in 1886, using midnight blue velvet. An example of one such from Poole is shown left, also in velvet, with frog fastening. Given the steady spread of smoking bans, perhaps such elegant leisure attire should be renamed – the drinking jacket, maybe, or the evening lounge jacket. Suggestions welcome. Cloth - Men are going Soft - Cloths to make you Taller - Woollen or Worsted? WE learn that moves are afoot to establish a bespoke training centre in Savile Row but in the meantime a new training course starts early next year at one of the London colleges.. This will represent a major strengthening of the Row’s tradition. Not since the days of the Tailor & Cutter Academy has there been an establishment devoted to the special needs of the bespoke craft and for the essentially small tailoring businesses to invest in training young newcomers is an expensive and time consuming exercise, especially when the trainee is of course free to move on once beginning to be competent. It takes many years for a tailor to become truly a craftsman and most of the present heads of the Row’s firms will have learnt their craft from the lowliest rung on the ladder. There is no quick route here. Two examples of sons who have taken over from fathers at major names started very much as juniors and were sent off the learn about textiles and overseas selling as well as the actual business of tailoring. Most houses receive applications from youngsters attracted by Savile Row’s reputation but few have been able to find places. A training centre to provide a basic training has been needed since the Tailor & Cutter Academy closed in the 1970s. And now, Savile Row Bespoke Ltd, a new body set up last year to help boost Savile Row’s traditional craft, has organised a training programme that covers all the basic skills required. These will then need to be developed in the work place, under the close supervision of older craftsmen, but at least they will have an insight into the mysteries of bespoke.